We are three little girls in Siu family. I am Esrene, the big sister, I am Rennice the 2nd sister and I am Anndelle the baby sister. You will get to know us more through our life journey. Hi, yea yea, ma ma, po po, aunties and uncles. Welcome to our blog that record the journal of our life. Mummy already 12 weeks pregnant! Today, mummy and daddy sent off grandma grandpa to the airport then went to Boxhill Woman Ultrasound center to see me from the scan. 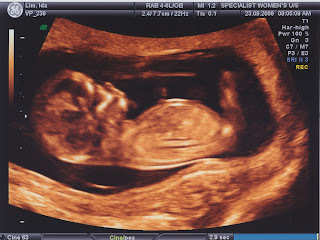 Mummy was very nervous at first before the scan as this will be the first time they will see the real shape of me! Dr Michael introduced himself and started the ultrasound scan on mummy's tummy. Mummy daddy can see my picture appearing at the big screen infront of them! Finally, I am able to say "hello" to daddy mummy from the screen. They were so excited to see me moving too! But most of the time I was sleeping. The scan went very well. Dr Michael explained to them my formation and told them that everything looks great on me! They can see my little fingers, can see my legs, head, even eyes and nose. My heart is beating very fast with 181 mbps. Finally doctor measure my height, I was just 5.83cm now! Daddy mummy can't wait to see me growing quickly. They even ask Dr Michael for my photos and also video in DVD. They watched the photos and dvd again and again as if they are very bored with it. They love to see me so so much. They even sent my photos to aunties uncles in Christ and are praying for me to tell them I am in good health. 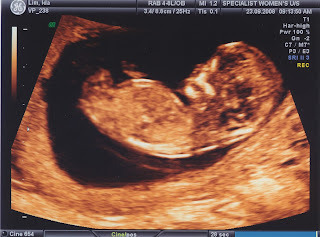 Daddy mummy will be able to see me again through the ultrasound in 2 weeks time! Finally grandpa and grandma came to visit daddy and mummy in Australia. They brought a lot of stuffs over for them - clothes, slow cooker, even sour plum! They have been very kind and helpful, help cooking dinner for daddy mummy. This is a great help for mummy. Finally mummy is able to eat more proper home cooking. Mummy loves grandma's steam fish and porridge! Everyday, after get home from office, grandma already finished preparing dinner on the table. Daddy mummy really enjoyed the time together with grandpa grandma. They even brought grandpa grandma to tulip festival on the weekend before they flied back to Malaysia. On Tuesday morning, they sent off grandpa grandma to the airport to fly back to Malaysia. They miss grandpa grandma alot! I miss them too. Can't wait to see them again in 4 months time!